Mumbai Indians scored 139 runs after losing five wickets at the end of the allotted 20th over and the innings of Chennai Super Kings was rolled back for 79 mere runs with 28 balls still remaining. 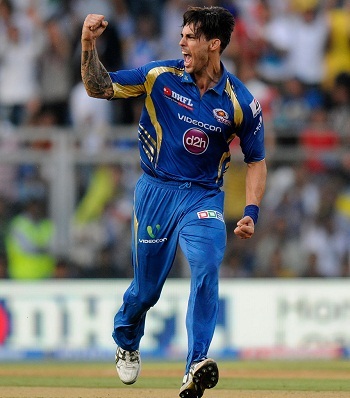 Mitchell Johnson (Mumbai Indians) was announced ‘Player of the match’ for his deadly bowling in the early parts of the Chennai Super Kings innings. The 49th match of the Indian Premier League was played on Sunday, May 5, 2013, at Wankhede Stadium, Mumbai. Earlier, Rohit Sharma, the captain of Mumbai Indians, won the toss and liked to bat first at his home ground. Dwayne Smith and the little master, Sachin Tendulkar, got off to a slow start by scoring 21 runs in the first five overs with a couple of boundaries from the first. Tendulkar hit 1 six and 1 four in the next over and the score was taken to 40 when he was held leg before wicket off Ravindra Jadeja for 15. Smith was caught and bowled by Dwayne Bravo two runs later for 22 and Kieron Pollard was caught by Suresh Raina at long on at the bowling of Jadeja for just one run. The home side was in some sort of trouble at 3-45 in 7.4 overs as Dinesh Karthik and Rohit Sharma got together. Karthik opened up in the 12th over by hitting 1 six and 2 fours on the first four balls and was caught on the fifth by Raina off Jadeja for 23. The next batsman, Ambati Rayudu, scored 10 runs before his stumps were uprooted by Ravichandran Ashwin as Harbhajan Singh and Rohit Sharma accelerated the run rate with the help of few boundaries. They added 13 runs in the 18th over with 1 six and 1 four followed by 19 runs in the final over with another six and two fours. The hosts reached 139 with five wickets in hand after 20 overs, Rohit Sharma remained unbeaten for 39 off 30 with 1 six and 3 fours whereas Harbhajan Singh contributed 25 comprising 2 sixes and even fours. 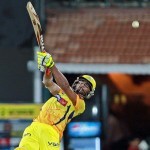 Chennai Super Kings had the worst start of the tournament as Mitchell Johnson bowled his heart out. He removed Murali Vijay, Suresh Raina and S Badrinath for 2, 0, 0 and the visitors were struggling at 4-18 in 4 overs. Ashwin associated with the opener, Michael Hussey, and they accumulated 16 runs before the first was gone for just two runs. Hussey was caught by Smith off Pragyan Ojha for 22 and MS Dhoni multiplied the worries for the tourists after scoring 10 runs. Ravindra Jadeja witnessed the fall of his batsmen at regular intervals and was dropped by Kieron Pollard in the 14th over. He was the last batsman to be dismissed for 20 off 16 with 2 fours as the entire team surrendered for 79 runs in 15.2 overs. Mitchell Johnson and Pragyan Ojha were the wrecker in chief with three wickets each, Lasith Malinga got two whereas Pawan Suyal and Harbhajan Singh shared one wicket each. 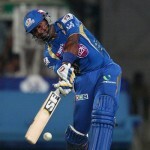 Mumbai Indians won the one sided game with a big margin of 60 runs and held the third position with 14 points. Worst ever humiliation for CSK. They could have done better even after disaster start as they had very good batting lineup.